FRANCE, May 6—Former banker Emmanuel Macron won the French presidential election runoff, beating the Trump-like neo-fascist Marine Le Pen. May Day marchers called it a choice between “the plague and cholera.” Voters chose cholera, mainly to stop the plague. Although Macron won with 62% of the votes, probably half of his voters see him as the lesser evil but still hate him. For example, Macron led the fight to revise the French labor code and rip up what few protections workers have. The whole labor code is now optional: if the boss and the workers consent, then they can sign an “agreement” that violates it. For example, they can “agree” to drop overtime or work a 50-hour week. Why would workers agree? Because the boss threatens to close the factory. Ni Le Pen! Ni Macron! Ni Patrie! Ni Patron! (Neither Le Pen nor Macron; neither fatherland nor boss). Few marchers called for communism rather than anarchism or socialism. There is a “Communist” party in France but it has been revisionist (capitalist in essence) for many decades. Its leader called for a vote for Macron without saying so directly. Not even the popular “leftist” Mélanchon (the French Bernie Sanders) calls for communism and he’s even cagey about whether he’s for any kind of socialism. Instead workers are offered a buffet of political choices, all of them just capitalism with different flavors: “alt-right,” “right,” “centrist,” “socialist,” “left” etc. Any of them will give you some kind of food poisoning. They are all firmly committed to money, markets, the wage system and economic competition. All are nationalistic. 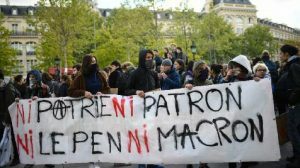 Mélanchon and Le Pen are (or were; they’re waffling) for leaving the European Union and going back to the French Franc! In fact, xenophobia aside, the programs of Mélanchon and Le Pen have a lot in common. Workers, however, are fed up with high unemployment, racism and sexism and xenophobia, lousy minimum-wage jobs, and “precarité” (economic insecurity). They’re looking, ever more desperately, for a way out. Communism is the only way out. No capitalist politician (including socialists) has anything to offer our international working class. As the need and possibility of communist revolution grows, our task remains clear. 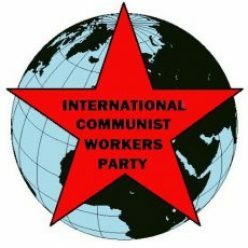 Join us to help build the International Communist Workers’ Party (ICWP) among French speakers from Europe to Africa to North America—and, for that matter, among all workers. One international party, one fight to mobilize the masses for communism!